Stir fries are always a perfect go-to meal, especially when you want to quickly toss together whatever is in your fridge. One of my favorite parts about stir frying food is that you can have a lot creativity with your ingredients. If you don't mind having a simple, basic stir fry without special authentic Chinese sauces and the like, you can whip together ingredients that you already have on hand. Almost all types of veggies are fair game, and so are your proteins. While I do enjoy my stir fries with chicken, pork, tofu, and steak, sometimes I don't have those meats defrosted and sometimes I just want a break away from the same old foods. When you want the flavors of a certain dish, you don't have to make the meal complicated; sometimes simple is all you need to make a tasty meal! Having leftover chickpeas from my Fresh and Simple Chickpea Salad recipe, I decided to use them as my protein source for this stir fry dish. The resulting stir fry came out filling but not too heavy. It also took a LOT faster to cook than frying traditional meats. 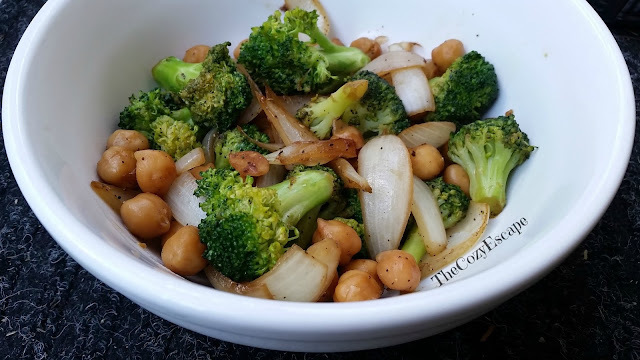 If you are in a time crunch or you simply want to experiment with a different take on a classic meal, try my Broccoli, Chickpea, and Onion Stir Fry dish. If you don't have chickpeas on hand, use whatever other canned beans you have and let me know how it tastes! Put all of your broccoli pieces into your frying pan and cover their bottoms with a 1/4 cup of water. Cover the frying pan with its lid, and turn on the stove-top temperature to a medium-low setting. You are just going to lightly steam these broccoli pieces; they are ready once the broccoli heads turn dark green and are slightly softened. As you are going to fry them later on, you don't want to overcook them now. Once the broccoli has reached this desired texture, drain the broccoli and set it aside in another bowl. Heat the olive oil in the frying pan. Once the olive oil has heated, slightly lower the temperature and toss in the onion. Sauté the onion until it just begins to turn brown around the edges. 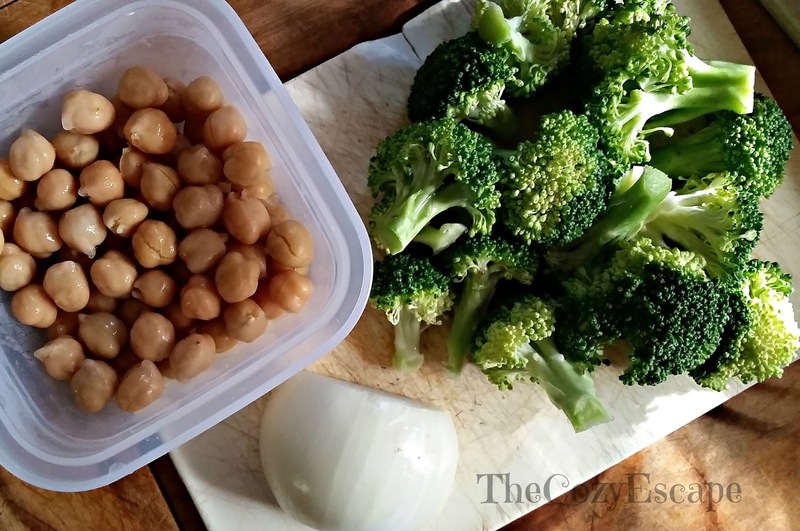 Combine the chickpeas with the onions and continue frying. Occasionally stir the mixture to make sure that all sides of the chickpeas are being cooked and to keep everything from sticking to the pan. Once the onions are completely soft, toss in the broccoli and soy sauce. Mix everything together and taste it, adding salt and pepper as needed. Fry the chickpeas and veggies for about 2 more minutes. The chickpeas will begin to crisp on the outside. 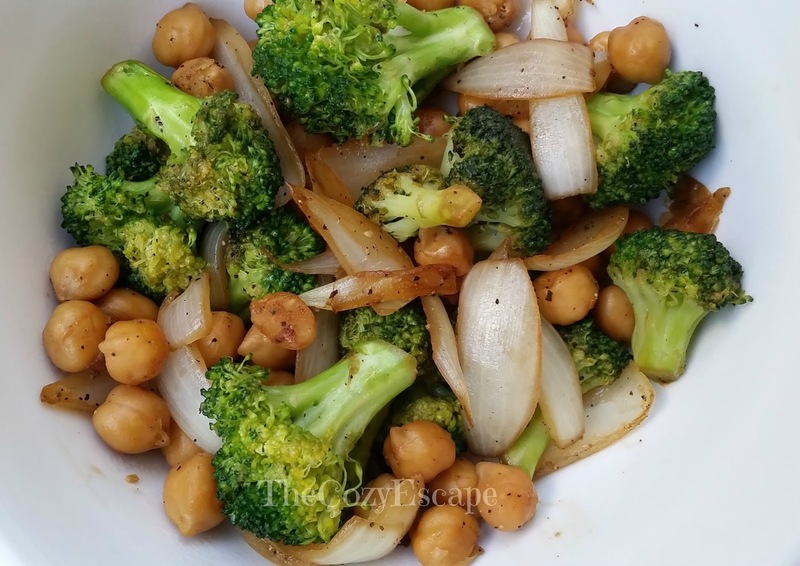 After 2 minutes, serve the chickpea stir fry warm.